Hear detailed visual descriptions supported by tactile support material of selected artworks in Archibald, Wynne and Sulman Prizes 2019 delivered by specially trained artist educators. 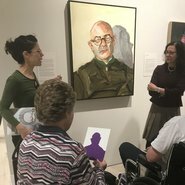 The artist educators aims to create a picture in the mind’s eye, connecting a viewer who is blind or has low vision to artworks in the exhibition. This event occurs seated in the exhibition.